ERDAS APOLLO is a comprehensive data management, analysis, and delivery system. It is an interoperable OGC/ISO-based solution that efficiently organizes massive volumes of data (imagery, vectors, terrain, LiDAR, web services, and virtually any digital object in the enterprise). ERDAS APOLLO consistently delivers geospatial data faster and using less hardware than competing server-based products. Solving data organization problems universal to governments, businesses, and other organizations, ERDAS APOLLO can be customized and extended to fully satisfy your geospatial and business process requirements. ECW for ArcGIS Server is an extension for ArcGIS that provides compatibility with the enhanced compression wavelet (ECW) image-compression format, enabling you to serve ECW imagery from ArcGIS Server 9.3, 9.3.1, 10, 10.1, 10.2, 10.3 and 10.4 through Esri-supported service interfaces. Users worldwide rely on ECW technology to save time during imagery processing and transfer, and reduce the hardware requiremnts for their geospatial workflows. It enables you to compress bulky imagery files into manageable sizes while preserving the visual quality of the images. 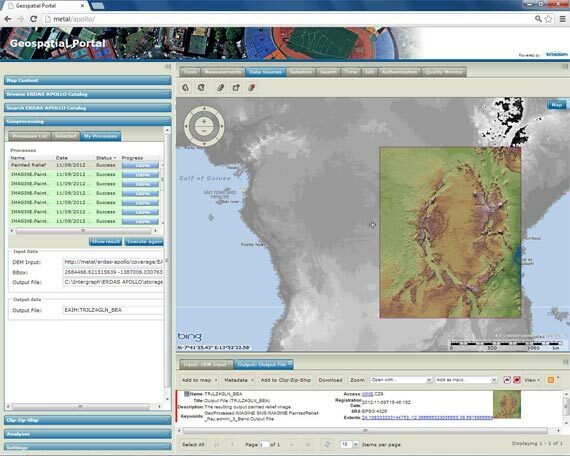 It includes multi-resolution level of detail within the file, eliminating the need to generate or distribute tile caches, pyramids, or overviews. ECW also supports opacity channels, allowing images to overlay other imagery cleanly without showing compression artifacts around the edges.